Starring: The vocal talent of Winona Ryder (Edward Scissorhands), Catherine O’Hara (The Nightmare Before Christmas), Martin Short (¡Three Amigos!) and more. Rated: Rated PG for scary images/scenes, thematic elements. 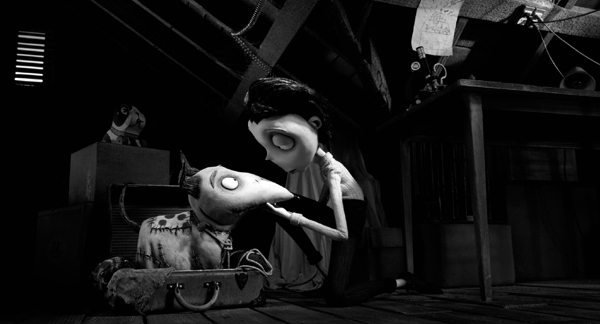 Tim Burton’s 1984 short, Frankenweenie, becomes a full-length feature in this new take on an old tale. Tim Burton’s personal passion project focuses simply on a boy and his dog. In fantastic stop-motion animation, Burton brings his characters to life and makes audiences fall in love with, care for, and laugh at/with them all at the same time. 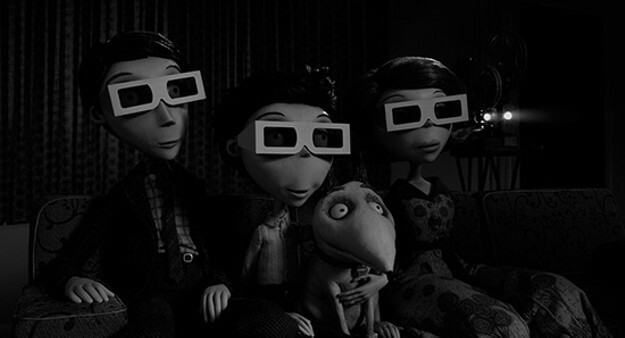 Burton’s eccentric dark look and feel is mixed with comedy, lightheartedness and love in this amalgam of black and white, stop motion animation, and 3D. It’s amazing the emotions that Burton is able to portray and evoke through the expressions of his characters matched up with music. 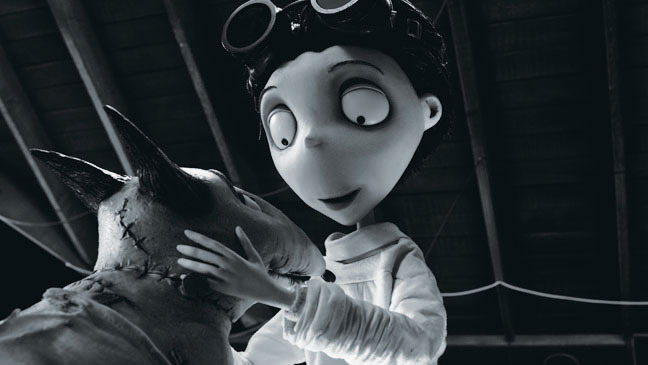 His expertise in his brand of filmmaking is what makes Frankenweenie work so delightfully well. Young Victor’s relationship with his dog Sparky is so genuine and realistically shown through the puppet mastery. There are moments of laughter and times in which one may almost tear up in thinking about their own relationship with a pet. One of the best elements of this film is Burton’s use of Black and White. In a time when B&W is used mainly for artistic purposes only, Burton utilizes it to parallel the events in the film to that of the original Frankenstein story and movie. So appropriate and so impressive. There are also other references to additional old school scary monster movies that were subtle and truly added to the feel of the story. Needless to say, I’m sold. Come the end of the movie, a few additional roller coasters of emotions roll through as the final act plays on. I’m sure some will cry [I didn’t. Promise! 😉 ], many will laugh, and all will smile. I had no true interest in seeing this for sake of the story, but well before the end came, I was real glad that I did. 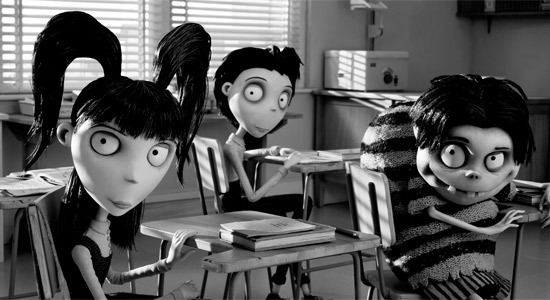 Some scenes may be a few frightening for kids of a younger age (it is Tim Burton after all), but I recommend Frankenweenie. A great family watch for this “scary movie” season! Skipped the review cause I havent seen it yet, but I was dying to know if it got a decent grade. Happy to see it did! Can’t wait to see how are notes compare this weekend when you see it. I’m excited to see this movie now 🙂 Thanks for the review! ha. ur comment made me laugh man. Thanks for reading. I don’t take my responsibility as a reviewer lightly. Thank you for taking the time to read and for holding my opinion in such regard. I look forward, though, to hearing your own opinion once you see it. I’ve been wanting to see this since the first trailer! Much better than Hotel Transylvania and more touching than Paranorman I expect. Paul. Welcome. Thank you for stopping in and commenting. I trust this one to be even better received than the 2 you mentioned as well. I hope to catch up with your thoughts. Please send me the link if you choose to review it. Ok, maybe I do need to check it out Friday. Nice review! I’m not sure whether I should see this or not. I like Burton’s gothic style, but his movies are usually hit or miss (hit: Ed Wood, miss: Planet of the Apes). I think I might check this out now though. Nice review. thank you. I hope you do. I’m NOT a Burton fan and I enjoyed this quite a bit. When you see it (if you do), please send me the link for your review. I’m not a big Burton fan either, so it’s encouraging to see that you gave this a positive review despite not being one yourself. I remember. that’s right. I was trying to remember who, along with me, wasn’t so big of a Burton fan. well, I can say I did enjoy this one. Hope you get to see it. I’m scared to see this movie because I’m worried it’s going to be sad haha. But if you say it’s good then I’ll go check it out! Wait a minute… I’ve already seen this movie! Burton made this like almost 30 years ago. I’ll wait for Blu Ray then since I know what happens (if its the same as the original). This looks really cute! I just got introduced to Burton’s animated feature Corpse Bride which I really enjoyed, so I might give this a rent. Looks like he’s still got it after the dismal reviews of Dark Shadows! 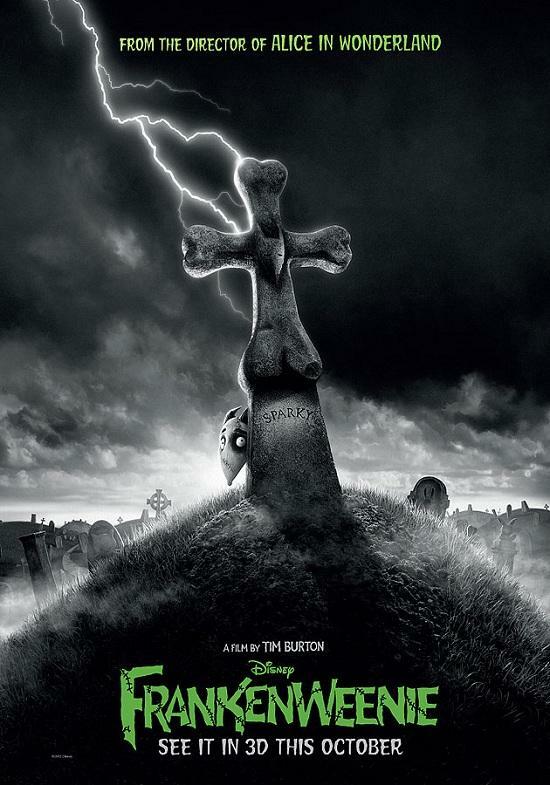 Frankenweenie is a win for Burton. Do go see it Ruth! Great review! I can’t wait to see the movie, I love stop-motion technique and the last films by Burton were so disappointing, while whenever he used this technique he really made wonderful and unforgettable movies. The story in this one seems lovely too, unlike the mess that was Dark Shadows.